Sunday Morning Soliloquy - Musings of an Urbanite: You Should Hire Brendan Tripp! You Should Hire Brendan Tripp! I sometimes interview very senior level marketing executives or professional consultants in order to gain insight on their business and learn from them. Hopefully, the people who read my blog will find the information valuable and learn from the experts too. Recently, I had a thought, “What if I interview job seekers.” I wanted to share talented, experienced, available professionals with my friends and colleagues. I hope you'll find this useful. My first interviewee is Brendan Tripp. I met Brendan at Social Media Club party that took place Chicago Mercantile Exchange last winter. Brendan is somewhat of a fixture on the networking scene in Chicago. He networks 2 nights a week at minimum but never more than 4 nights per week. Brendan never drinks and he comes armed with a stack of business cards. Brendan’s unemployment has been a slow fade. His former employer was a start-up that slowly died last April. The company was called Simuality and then turned into Liminaty – they were a company focused on virtual reality platform and social media. They were planning an online virtual reality web and television show called Planet’s Best DJ in conjunction with Violator. The whole project sounded pretty cool but unfortunately their funding fell through before they could pull the project together. Brendan has a long history and I’d like to share it all with you, but before I delve into his arduous background, I want to share Brendan’s goals and his job hunting process with you. If you’re interested in Brendan after that, I encourage you to read on – Brendan is an interesting dude. Since June of ’09 Brendan has been actively looking for work. I talked to Brendan about his process and how he looks for work, his daily routine. Brendan explained that he also scans the job boards on Twitter and gets about 5 – 12 plausible leads a day. Sending out about 5 resumes a day. He recently wrote a blog post on the Job Stalker about who to follow on Twitter for job hunters. Brendan applies for: Standard PR jobs, web management, content management, writing jobs, social media and jobs in the virtual world. He got that job because the former “Job Stalker” was hired by the Tribune Company. To replace the “Job Stalker” Chicagonow.com ran a contest on the blog and Brendan won the contest. He sets a goal to read 72 non-fiction books a year. He writes book reviews and publishes them on the web. Initially, he would reach out to publishers but his online reviews have gained enough traffic where they publishers now know who he is and they send the books to him. Web manager for a PR and Communications business. He also really feels strongly about working for a not for profit or an Association. Being able to write book reviews, he would love to get paid for this. Brendan’s career was developed in the Food/PR business. The best part of my interview with Brendan was the knowledge I gained about the food industry and the progression of the food industry from the 70s through the 90s. The big business of food and food sciences and how the industry has changed over the decades – in one man’s opinion. Brendan is a bank of information on packaged food history, I think he has a book in him and may not realize it yet. Brendan was born in Chicago, his mother and father were both in the newspaper/pr/advertising business. Brendan’s father died when he was two and his mother went out to NY to work for J. Walter until 1966 until when she was transferred to the Chicago office. Essentially, Brendan Tripp grew up in the story spinner business. Brendan’s mother was made a VP at J. Walter in 1966 but transferred back to Chicago. According to Brendan, it was “Because there was no way that they were going to make a woman Vice President in the corporate Headquarters in New York.“ The thought of having a female VP in the corporate HQ in New York was out of the question at that time. We're talking real life Mad Men! Brendan started at Northwestern University in Evanston but did not finish at Northwestern. While in college, Brendan got involved with the counter culture movement and joined The Foundation Faith of the Millennium. Sounds like something out of a Charlie’s Angels episode to me, a sign of the times in the 70s. Brendan was spending so much time with the Foundation that he ended up withdrawing from Northwestern and transferring to Lawrence University in Appleton, Wisconsin. He obtained his Liberal Arts degree, his concentrations were in Eastern Religion, English and Art. In college, Brendan was on the radio a lot, he wanted to be a DJ. Upon graduating from college, Brendan sought a position as a DJ - or anything in radio/television but had no luck securing a position in radio/television. In 1976, Brendan’s mom left J. Walter & started her company, Marian Tripp Communications, Inc. While he was still in college, Brendan spent much of his time working for his mother. Soon after graduating, Brendan joined his mother’s company full time as a publicist and eventually worked his way up to VP. Most of their clients were consumer packaged food and products – all blue chip companies such as Uncle’s Bens, Kraft, Pillsbury, Quaker, Pace Picante Sauce. 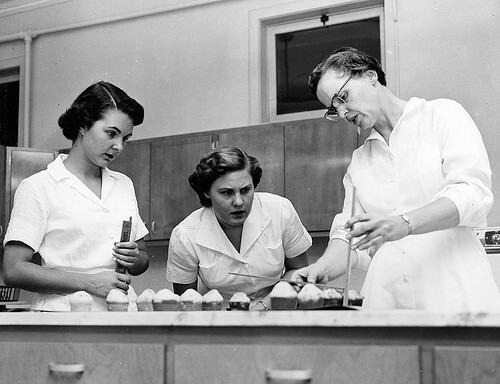 Most of the other senior level employees at the agency were Home Economists who created recipes for the newspapers & magazines. Three different sets of press releases were released each month for the newspapers to ensure that two papers in the same city were not running the same article that included the same recipe. Brendan was not a Home Economists so he ended up handling most of their conferences and events; which is how he became a Certified Meeting Planner – CMP. He was managing three major conferences a year, two-day conference with top name presenters where the attendees were food writers. This was important to the agency as it established a strong relationship with the food writers. Kraft introduced a product called A la Carte Entrees where they used retort pouch – basically the technology used to the meals-ready-to-eat (MRE) in the military. You dropped this pouch into a pot of boiling water and you had your meal. When Brendan wasn’t working on organizing the conferences, his specialty was publicizing products that were more complicated and needed some additional explaining. Sausage Maker was another product. A seasoning product that one put into beef and made it taste like pork sausage. He also worked on Coffee Velvet – a coffee flavoring. And one of Brendan's absolute favorite products was called Smart Meat – it is a product of Goldberg Foods (the guy who invented Pizza Rolls). SmartMeat was cutter-canner grade beef; completely lean, grass fed never fattened and really environmentally friendly with low cholesterol. They would take primary cuts of cutter-canner grade beef and through a process of vacuum chamber pulling in a flavored margarine-like substance (no cholesterol) and making the very, very lean beef it would tenderize the beef leaving it almost like a cut of Prime Beef. Brendan explains that in the 90s, the business started to shift, trends started to take a different direction. “Back in the 60s and 70s, individuals started their careers at companies like Kraft by stirring vats of cheese curd. In the 90s, the consumer packaged goods industry took on a Harvard Model – new MBAs who are more concerned with their career than they are the quality of the product.” The objective was to cheapen the product and grow the profit margin. The MBA would get a promotion upstairs and a younger MBA would start. By the time the third MBA got his hands on the product, the product was no better than a generic. “Brand be-damned”, by the time the product got to the point where it was no longer a leading brand, the MBAs were working upstairs far removed from the brand and it did not matter to them anymore. According to Brendan, some wonderful, classic brands were being slaughtered because of this “Harvard Model”. I the 90s, the word “measurement” started to become something that every marketer was looking for in their agencies. The agency was up against the MBAs looking for measurement. “How can you measure the success of that program?” I think we’re all very familiar with the term “measurement,” our clients all want us to measure. The problem was, it cost the agency (and the brands) more money to measure the program than it did to run the program. This was around the time his mother decided to end the business. In ’93, Brendan and his wife took a vacation, they drove to Galena and were involved in a terrible car accident. Brendan suffered significant injuries and was air lifted to Rockford. They didn’t know if he was going to live or die. He was out of work for about 5 months. His mother had difficulties running the business without him. Throughout the years, the business had made some wise investments, so they ultimately decided to close the business. When Brendan recovered from his injuries, he did not have a job to go back to. Without a business to go back to, and a love for writing, Brendan got into the publishing. Brendan used to write a lot of poetry, about 250 poems a year. When he reached 500, he would put the poems together and make a book. He started his own publishing company in ’93 called Eschaton. He quickly learned that no one buys poetry unless they’re at a poetry reading. He likens poetry books to a concert T-shirt. His first effort of trying to sell poetry he bought enough ads to make about 1 million impressions and he sold 1 copy. Breandan decided, “This is not going to work this way.” Brendan eventually developed a line of books for his publishing company, Eschaton, working a number authors. Eschaton’s books were metaphysical, new age, eastern religion books. Brendan spent a total of 10 years in the publishing business. Brendan’s mother fell ill in the ‘00s and died in 2004. The last days of her life Marian Tripp needed 24/7 care. With what was left of the estate, Brendan and his wife purchased a franchise called “Club-Z In-Home Tutoring.” It was a very good program but they didn’t have the same resources as some of the larger tutoring franchises. When they purchased the franchise, they were one of 27 registered tutoring programs in Illinois. That following year, No Child Left Behind was passed and that year 290 registered tutoring programs popped up in Illinois. The tutoring business ended up turning into, as Brendan puts it, “selling used cars.” Everyone was trying to get the government money selling one more hours of tutoring. Brendan was managing the marketing for the franchise. They were just not happy with the way the franchise was going so they sold it to another franchisee. In 2002, Brendan went back to school and took web development and business programming classes at the Chubb Institute. The program was very intense, out of 84 students only 3 made it out. Brendan was one of the 3 men still standing and Brendan got a 4.0. But that was right after the dot com bust and he had trouble even getting an interview. Around the same time, Brendan had gotten involved with the virtual reality game, Second Life. A website that Brendan frequently visited, www.Librarything.com was having a get together on Second Life each week. In 2007, the Second Life conference took place in Chicago and Brendan attended. He got on the MacArthur Foundation track for getting not-for-profits involved in Second Life. That was where he met up with the company Simuality. Good "reporting" Leyla, and I definitely learned a lot about Brendan who I've seen and spoken with at many networking events but never took the time to get to know him better - the plague of networking... A few minutes per person.